I'll be short and sweet with this. Old Spice is a nice brand that we all like because it makes us smell good and occasionally shocks and stupefies its audience with advertisements that are surrealistic and surprisingly well-written. 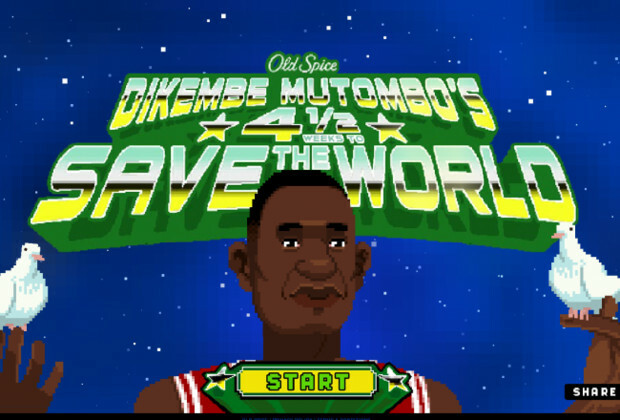 Their newest outing stars an 8-bit incarnation of professional basketball player Dikembe Mutombo Mpolondo Mukamba Jean-Jacques Wamutombo as he tries to save the world before the expiration date the Mayans left for us. The writing at times may hinge too much on RANDOM! GOOFY! WOAH! And I'm still not sure what the target audience necessarily is. But I think there's a little bit for everyone. The music is great. The gameplay is polished. The look is classic. The voice acting is top-of-the-line. The writing for the most part is hilarious when paired with the voice acting. The only thing that may be considered a flaw is that each new level (as they are released week by week) seems to be getting easier than the last. But if you want a free high octane thrill ride that is clearly a labor of love, play it right goddamn now.